Calvinism is characterized with a prophetic commitment to the compatibility between Divine Sovereignty and genuine human responsibility. While this involves a general compatiblism between predestination and free will, unlike physical determinism, it insists that man's agency transcends the laws of nature. But it also attributes the causes of human choice proximately to the effects of sin and grace so that different choices do not all have the same kind of explanation. Some choices are the result of the corruption of sin in humanity since the fall of Adam. But to the extent that choices are not sinful but righteous, this is due to the free grace of God curbing, regenerating, or sanctifying the character of the person. This differs from person to person with respect to the willingness to submit to God in his Son, Jesus Christ. But even the unbeliever's goodness is the result of God's grace, given to all but not sufficient for salvation, and which also prevents people from being as bad as they could be and makes the social world stable to allow for the church to fulfill it's mission. Thus, all sin comes from man and all good comes from God. Further, the good that God gives is totally up to him and not based on any perceived difference in quality between persons, but only according to God's own wisdom and pleasure. This is not unjust per se, since apart from grace there is only the just judgment of sin, but God is free to show mercy to whomever he may. There are problems with the view, such as that since behavior is the necessary and efficient function of the grace God gives each person in dealing with sin, so that one cannot choose otherwise than what one chooses. This seems to fail the requirement of free choice that someone be able to choose otherwise than he does. A Calvinist is free, however, to appeal to the standard counter-examples to this requirement, such as those given by Harry Frankfurt. Another problem is that it makes redemption depend on religious luck instead of justice. 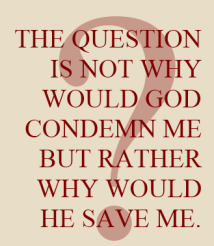 But as we saw, the question is not why would God condemn me but rather why would he save me. Further, Calvinism gives an answer to the problem that vagueness nay raise for salvation - the soteriological sorites problem. We are saved through faith in Christ but faith is a virtue concept and thus inherently vague. How much faith is sufficient faith? There are paradigm cases but most are somewhere around the penumbra of faith. But Calvinism solves the problem by making God the ultimate cause of faith and God can discern which ones have sufficient faith precisely because of his own grace. This provides an epistemist solution to the vagueness issue. Another problem is whether a Calvinist who understands the full implication of theistic determinism can truly make an effort to live a faithful life or even choose to believe After, all if it is ultimately out if my hands what I do, why bother? The answer is that Calvinists are even more responsible to live by faith and obedience because if Calvinism is true, then living by faith is Newcomb's paradox rationality. Newcomb's paradox is a thought experiment in game theory. Suppose a wizard appears before you and shows you two boxes. In one box, is a 1,000 dollar bill, but the other box is completely sealed and opaque. You can't see inside of it. Before you decide, I want you to know that if you pick both the boxes, I will leave the opaque box empty. But if you just pick the opaque box, I will put a million dollars in it". But you say, "The opaque box is already sealed. How can you change what's in it or not?" The wizard said, "I won't need to. Through my powers of divination, I have already foreseen which choice you would make and prepared the box according to my conditions." And then the wizard disappears. ~~~> What would you do? On the one hand it seems that you should take both boxes since no matter what is in fact in or not in the box you will add $1,000 to it. But on the other hand taking what the wizard said as true, it would be more rational to take just the opaque box. 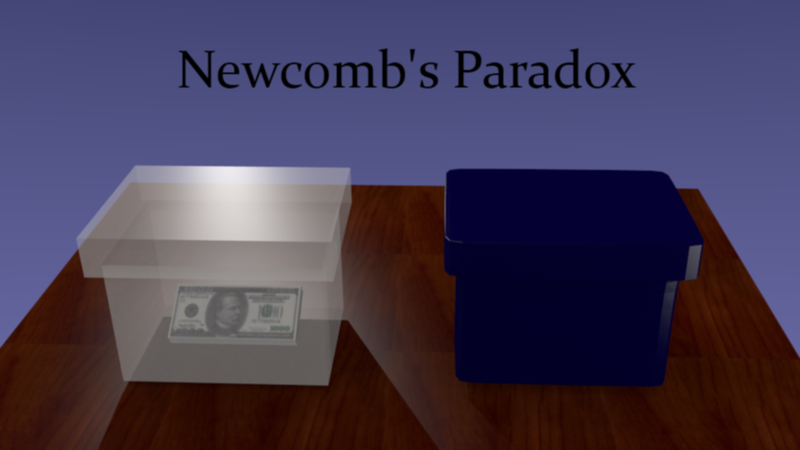 Taking just the opaque box for this reason is an instance of Newcomb rationality. 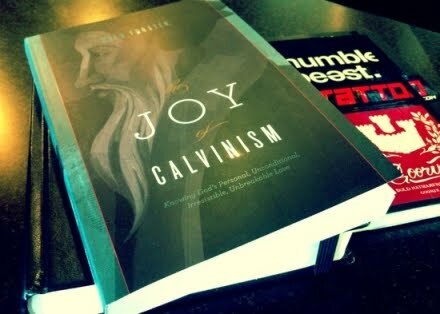 Choosing to act in faith presupposing that Calvinism is true is another instance of Newcomb rationality. Jesus says, "No one can come to me, unless the Father draws him and he who does come to me I will in no wise cast out". (John 6) Paul says, "Work out your salvation in fear and trembling, for God is at work in you to will and to do of his good pleasure". (Phil. 2) An unbeliever who is a Calvinist in belief may say, "What does it matter what I do. It's already a settled matter with God whether I am saved, so I will just live as I will.". But God said that if anyone comes it will because He has given him the power to do so and this is promised to anyone who comes to God. So for one to choose to live as they will is like taking the two box option. But if one chooses to give up self to live by faith, is like taking the one box option, according to Jesus promise. Paul's remark shows that this also applies to the believer's daily walk. What I want to say is that Newcomb rationality permeates the Calvinistic understanding of religion, and it's not much trouble to extrapolate it to the nonreligious good works done in common grace. Further, knowing this makes us morally responsible. Calvinism thus implies a kind moral freedom and responsibility that it makes the holder conscious of. Thus, Calvinism yields a kind of libertarianism (call it Newcomb Libertarianism) with respect to finding peace with God and living morally that ordinary materialistic determinism does not.